The just-released revisions to Metro’s proposed Fall 2012 service changes don’t include any significant Capitol Hill area-related updates from the the proposals for routes on and around Capitol Hill CHS documented in November. You can look at that in two ways. On one hand, Metro planners decided not to incorporate any feedback you provided via their online survey or at a series of public meetings on the changes. On the other, at least the agency isn’t proposing to tweak your commute any further. Meanwhile, a community group is rallying around pushing back the changes proposed for Route 2. Details below. The exception is Route 2. But the agency isn’t, yet, backing off its plans to slice the route connecting Queen Anne and First Hill via downtown. Instead, the revision from the November proposal is a tweak designed to replace service on the QA end of things. Our updates from November plus insights from Seattle Transit Blog’s Bruce Nourish, then, still stand. We’ve included most of that information again, below. Not everything in central Seattle was static, however. Central District News reports that Metro has backpedaled on its proposal to trim route 27. Nourish, meanwhile, sums up the rest of the revised proposal package here. He provided this overview of the proposed fall 2012 changes to us in November. We also recommend reading the comment thread on that post for some good discussion of the changes and the process. Thanks much to Aleks Bromfield for his contribution to that discussion. * Route 11 gets a major boost in weekday midday frequency from 30 to 15 minutes, while nights and weekends remain at 30. * Route 14N (the part of the 14 north of where it turns on Pike) is split off from the 14S and will cease service around 7 PM on all days; frequency will drop to 45 minutes on the weekends and weekday midday, staying at its current rush hour frequency. * Routes 10, 11 and 14N will now terminate on 2nd Ave & Pine/Pike downtown, exactly like the 43 does now. 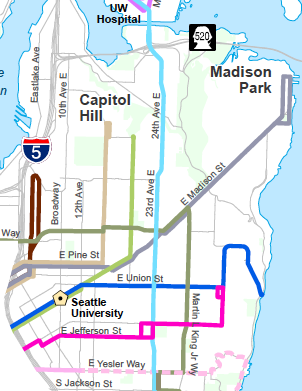 This means you’ll have to walk/transfer to get to the south parts of downtown and other places that those routes previously went to (Colman Dock, West Seattle, Jackson St/Mount Baker), but will make these buses much more reliable. * Route 12 will now loop around at Colman Dock, requiring a walk/transfer to get to the north end of downtown. Its frequency will not change, but see the next point. * Route 2’s northern segment, from the point where it now turns from Seneca to 3rd Ave will be deleted; instead, it will be routed down Madison/Marion just like the 12 (It’s probably worth showing the map below, to help readers understand this). The 2 will maintain its current frequency, but will be staggered to provide very frequent service from Colman Dock to the three-way intersection of 12th Ave, Union and Madison: 7.5 minutes during the day Mon-Sat and 15 minutes on evenings/Sundays. This is a very high level of service, some of the best in the city. * Routes 9X, 43, 48, 49, and 60 remain unchanged on Capitol Hill, but see the next two points. * Route 48X is replaced with more trips on the 48N, but the 48X operates only from Crown Hill to the U-District, so that shouldn’t affect riders on the south part of the route. * Route 60 is unchanged in Capitol Hill. Way to the south, it will stop serving the VA Hospital on Beacon Hill and be extended slightly in White Center, moving its terminus to Westwood Village. At this point, the most significant community effort in the area now seems to be focused on preserving Route 2 service. Here’s a flyer being distributed by a group hoping to push Metro to re-think the change. Bus 2 has a stop very close to my house but I’m okay with walking two blocks to Madison if it means more frequent service. 3) let it share stops with the 12 along Madison, which gives people travelling between 12th and downtown twice as many options (essentially doubles the frequency) of buses on Madison without changing service frequency or routing of the 2 in the CD..
4) Allows the 2 to serve the ferry docks. I think the writer of this story needs to go back and look at the service changes they are talking about. Moving the route 2 two blocks over is not a service cut. Though there will always be concerns about changes such as this, the benefits far outweigh the negatives. Metro seems to understand this. I hope that the squeaky-wheel minority doesn’t spoil this for the rest of us – we aren’t motivated to protest something that we quite like (hmmm – I see a metaphor for much bigger issues here)! If you are o.k. with the proposed changes to route 2, write, call, e-mail the County Council and Metro and let them know that there is more than one opinion in the neighborhood. This is definitely a “squeaky wheel” issue. Metro will be at the Madrona Community Council meeting this Tues Feb 7th at 7:15. The meeting is held at 34th Ave and Marion. 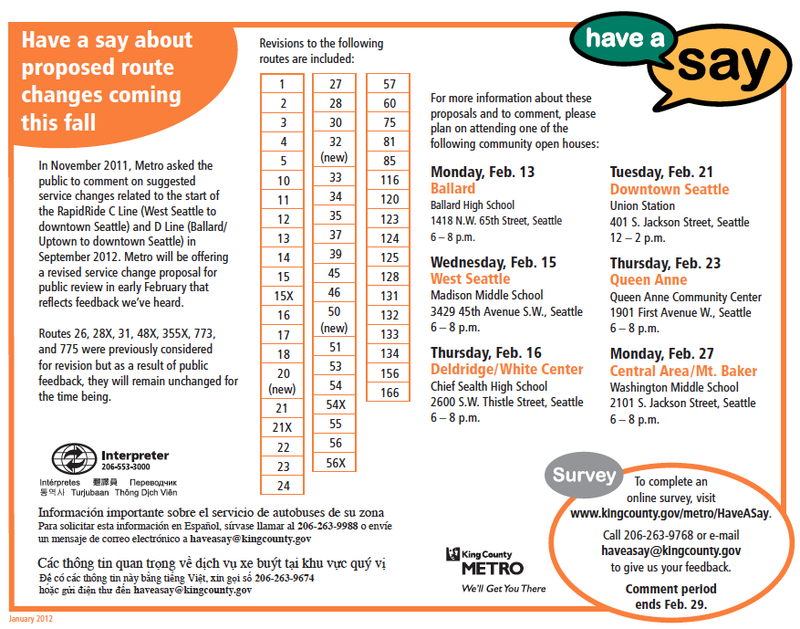 If you are OK w/ these proposed changes, you should definitely show up and/or call Metro to voice your opinion. Remember, satisfied people generally don’t make a lot of noise. There is significant, organized and vocal opposition to the changes. Metro will assume they represent the majority if you don’t tell them otherwise. *Metro said that they wanted to get rid of buses on 3rd Avenue and the turn onto Spring. *The new proposal has created an twisted, patched and unproven crosstown diesel route still on 3rd Avenue, still using Spring and Seneca routes (which can be improved) replacing a huge chunk of the what is a trolley and one of the most productive routes in the system. Where is the green (both types)? What is the projected productivity of the new #27 and #33 crosstown diesel (Leschi to QA)? *This patched thing is not very useful and difficult to use. *The #2 is the7th most heavily used route in the County and is too valuable a cross-town trolley service to be sacrificed. *If you live east of 12th Avenue your frequency would actually be less. West of !2th Avenue the #12 and #2 would staggered to provide greater frequency than exists in that area now. People want and use the #2. For what it’s worth, I’m actually not crazy about some of the major changes from the past version. In particular, the new 27 skips the fastest and most useful part of the old service. That route feels anathema to many of the principles which guided the original proposal. As far as I’m concerned, Metro is making a mistake with that proposal, and I hope they reverse course. If providing front-door service to Virginia Mason is essential, they should simply reroute the 60 to use Seneca between 9th and Broadway. As far as the 2 goes, I think it’s interesting to note that the 2 and 12 are effectively becoming two branches of the same service. Just like Metro has deleted the 4 to provide increased service on the 3, I think Metro should delete the 12 (whose tail is effectively served by the 10 and 11) to provide increased service on the 2. Imagine if the 2 came every 5 minutes during peak and every 10 minutes the rest of the day. Don’t you think that’s worth having to walk an extra 300 feet to the tunnel? I was a little late in seeing it.